Recently, Central Bank of Ireland deputy governor Ed Sibley drew attention to the need for financial services providers like Credit Unions to ensure they were investing in their IT in order to keep up with the risks that new innovations can bring. He urged boards and senior management to "prioritise the issue of digital transformation and allocate the resources necessary to meet their customers' needs." We couldn't agree more. In 2018 the team at Wellington IT have been working with our customers to deliver products and services that meet key industry needs, such as cuOnline+, Digital Signatures and an IT Managed Service. Behind all of these products is a dedicated IT infrastructure, and as your Credit Union continues to grow through new product and service offerings, we want to ensure that the back-end system grows with you and remains powerful enough to support your goals. To ensure this happens, we’ve made a €280,000 investment in our existing infrastructure which we’ll be rolling out in November 2018. This infrastructure upgrade allows us to future-proof our shared service environment and gives us the confidence to plan ahead, proactively responding to industry developments for the next five years and beyond. What does the upgrade mean for your Credit Union? Additional web servers and databases provide capacity for new products and services minimising disruption to your Credit Union. Replicated and load balanced servers means an overall increase in resilience during periods of high demand. 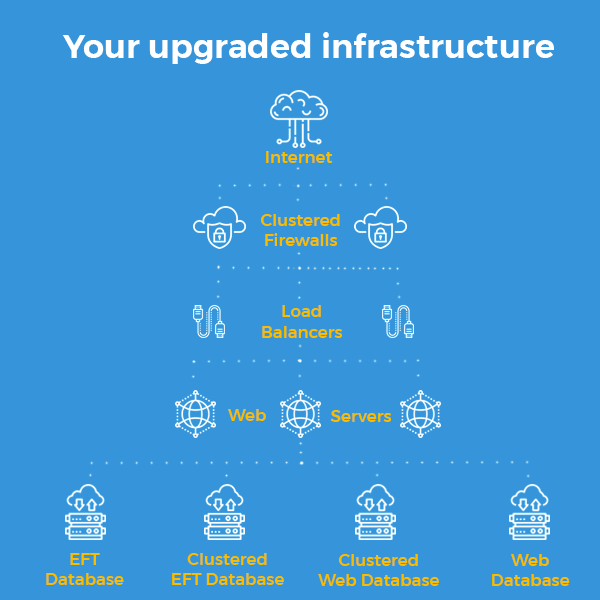 The upgrade facilitates our Business Continuity Planning for data centre services, giving increased reliability of business-critical shared services. Refreshing our IT infrastructure brings greater flexibility for future growth, strengthening current and facilitating new products, services and processes. It means we can stay agile, and ensure you can keep up with changing market conditions. The installation of this infrastructure upgrade will not affect the service we provide your Credit Union or your members, but if you have any questions, please get in touch with our Networks support team.